Technology has done much by reducing the distance of people staying in different parts of the world by a click. This is what has made native English writers wise, and now they use the internet to their advantage without the knowledge of their clients. Mostly, clients who want to outsource content for their blogs and websites will prefer writers in and around the US, or the article writing service based there, little do they know that their articles end up being crafted by non-native English writers. Ask a sincere US based writer, he or she will tell you that some of the most detailed write-ups originate from other countries. So, what happens? Simple, below is how writing jobs are subcontracted. At Upwork.com for example, which was earlier known as Odesk, clients post the jobs they want done on the dashboard. Some of them state very clearly that they want the task done only by native writers. Among the bidders, the client picks the writer with a U.S citizen profile not knowing that the writer will further subcontract the gig to their fellow non-US writers. If the client was willing to pay 25 dollars per 500 words article, the native English writer plays smarter by offering $8 for the 500 words article to their fellow non-natives but request a shorter delivery deadline for the same job. In this case, delivery mostly ranges between 10 to 15 hours for 5 pieces of 500 word articles. That means a profit of $17 per article; clean bucks! After the delivery, it’s now time for the native writer to perform some touch ups on what needs to be changed for the articles to sound natively written. In fact, this is the trend and you may also find it even with the most established article writing service that you may not imagine… –but let’s be kind not mention names here, because there nothing actually wrong with that. The above is not only practiced at Upwork.com, the subcontracting extends to other bidding sites as well. In fact, the practice is common with bigger profiles at Guru.com, freelancer.com and fiver.com. There, established writers especially the native English speaking ones, update their profiles to sound as if they are a writing company. Clients quickly give writing jobs to such profiles not knowing their job will be handled by non-natives. However, some clients have become smart and will want to hire the good non-native writers directly, because that way it’s cheaper. The advantage with this is, they don’t have to pay the $25 for a 500 words, they can have a perfectly written master piece at a half that cost. Moreover, they also end up establishing a good relationship with their writers, which means cheaper high quality articles and blogs, forever! 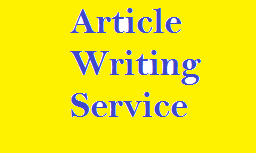 Send us an email to try our article writing service and you’ll not regret. We charge as low as $5 per 500 words article.